I have replaced the dish I had for receiving Es’hail 2 by a new one. The former dish was a 95cm offset from diesl.es which was a few years old. I had previously used this dish for portable experiments, and it had been lying on an open balcony for many months until I finally installed it in my garden, so it wasn’t in very good shape. Comparing with other stations in Spain, I received less transponder noise from the narrowband transponder of QO-100 than other stations. Doing some tests, I found out that the dish was off focus. I could get an improvement of 4dB or so by placing the LNB a bit farther from the dish. This was probably caused by a few hits that the dish got while using it portable. Rather than trying to fix this by modifying the arm (as the LNB couldn’t be held in this position), I decided to buy a new dish. In the QO-100 (Es’hail 2) narrow band transponder, the recommendation for the adjustment of your downlink signal power is not to be stronger than the beacon. This was also the recommended usage of the old AO-40. Since the transponder has two beacons marking the transponder edges: a CW beacon marking the lower edge and a 400baud BPSK beacon marking the upper edge, there has been some debate on Twitter about which beacon does this recommendation refer to and what does “stronger” mean. Of course, more formally, signal strength means power, which is a well defined physical concept, so there should be no argument about what does power mean. However, there are two different power measurements used for RF: average power and peak envelope power. I will assume that the recommendation refers to average power, not to peak envelope power. This makes more sense from the point of view of the power budget of the satellite amplifier (The total average power it needs to deliver is just the sum of the average powers of the signals of all the users, while the behaviour of the peak envelope power is much more complicated). Also, I think that using peak envelope power for this restriction would be a very strict requirement on high PAPR signals. Note that the PAPR of CW is 0dB and the PAPR of BPSK is between 2 and 3dB, depending on the pulse shaping, so these are rather low PAPRs. 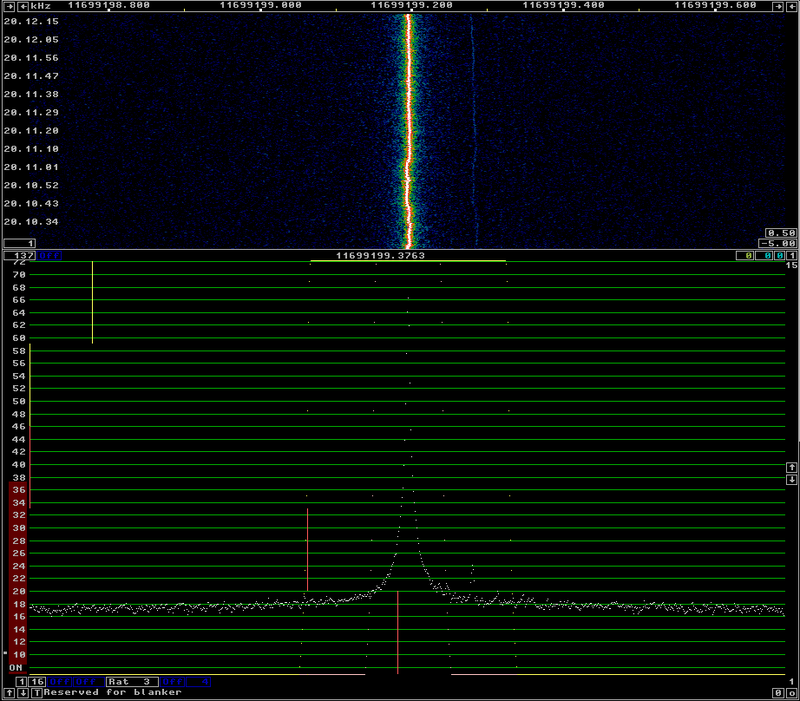 For comparison, a moderately compressed SSB voice signal has a PAPR of 6dB. In my opinion, the main problem with these discussions about “signal strength” is that many people are trying to judge power by looking at their waterfall or spectrum display and seeing what signal looks “higher”. This kind of measurement is not any good, because it doesn’t take signal bandwidth into account, depends on the FFT size, the window function, etc. It doesn’t help that many popular SDR software don’t have a good signal meter displaying the average power of the signal tuned in the passband. In any case, I was curious about whether the power of the two beacons is the same and whether there is any interesting change over time. I have made a GNU Radio flowgraph that measures the power of each of the two beacons and of the transponder noise, and saves them to a file for later analysis. Yesterday, December 23, MELCO carried out some in-orbit tests of the Es’hail 2 Amateur radio transponders. 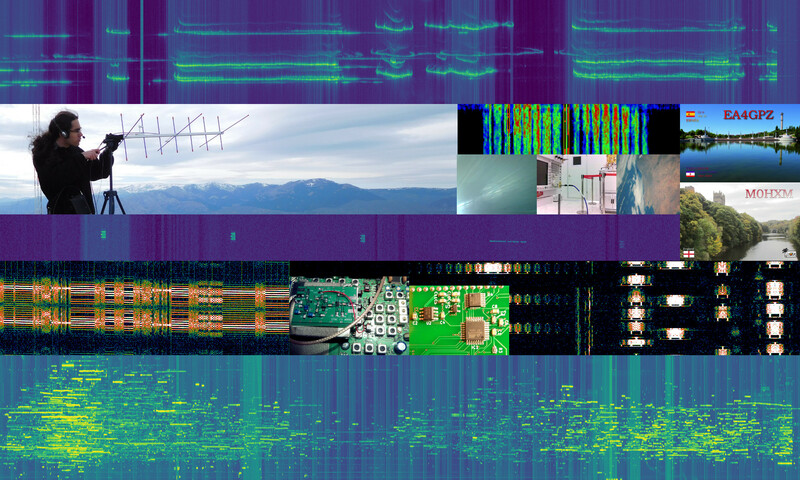 Since Es’hail 2 is currently under commissioning, it was expected that at some point the Amateur transponders would be activated for testing, but no announcement of the tests was done in advance. At around 11:00 UTC, Rob Janssen PE1CHL, noticed that the narrowband transponder was active and a carrier signal was being transmitted through it. Since then, I monitored most of the tests and sent updates on Twitter, together with other people (see also the posts in the AMSAT-DL forum). Without knowing the details of the test plans, we limited ourselves to watching and following the tests that were being made. If some schedule of the tests had been published in advanced, we could have thought, prepared and performed some interesting measurements on the downlink signals. Es’hail 2 is currently under commissioning. 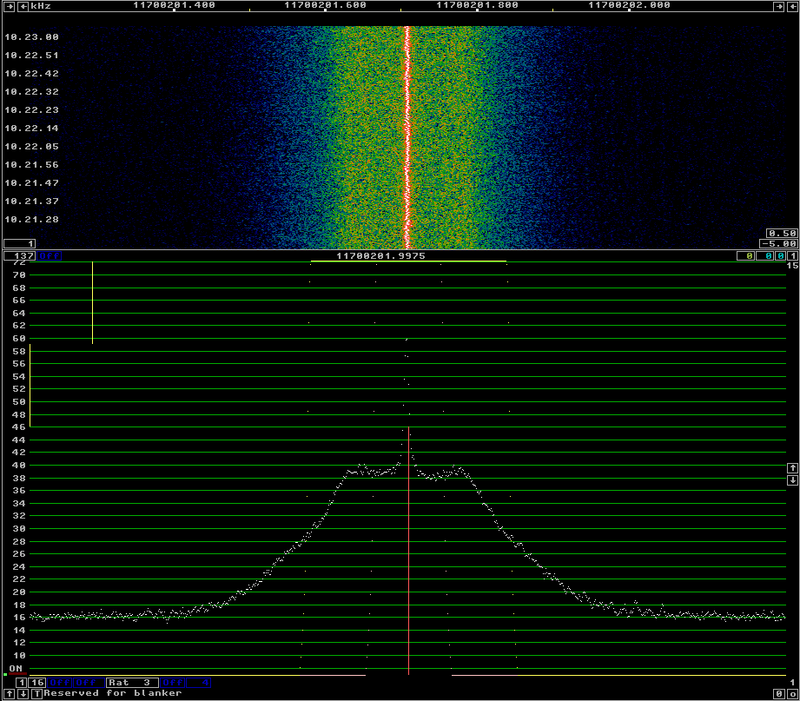 The 2.4GHz uplink of the Amateur transponders should never be used until authorized by AMSAT-DL. The Amateur transponders will sometimes be enabled for in-orbit testing by the MELCO/Es’hailSat/AMSAT-DL engineers. Relax, sit back, and watch the tests on the 10GHz downlink. I also think that publishing more information would be beneficial to educate the community of radio Amateurs. Some people have asked me about the concept of in-orbit tests. After a satellite is launched into orbit, the performance of all its systems is tested to ensure that it matches design specifications, simulations, and pre-launch tests done on ground. This is important to guarantee that any problems, malfunction or damage that occurred during the launch can be diagnosed and hopefully mitigated by activating backup systems or other reliability measures. In-orbit testing of large satellites can take several months, since there are many complex systems that need to be tested remotely. In the case of the Amateur radio payload of Es’hail 2, MELCO is carrying out the tests, since the payload was built by MELCO according to the design specifications by AMSAT-DL. The kind of tests they are performing are related to the performance of the bent-pipe transponders. They sweep in frequency the transponders to make sure that the passband shape is as expected. They transmit carriers of different power levels to check for linearity of the transponder and AGC performance, and they try different gain/power level settings of the transponder power amplifier to make sure it performs correctly over all its working range. This is a rough account of the tests that were made yesterday, using my tweets as a sort of activity log. In some of the latest posts, I’ve being talking about the phase noise performance of 10GHz receivers, and in particular, of 27MHz references for Ku-band LNBFs (1, 2, 3, 4). Indeed, this started when I checked the performance of my new 10MHz GPSDO and 27MHz PLL by DF9NP and I wasn’t too happy with the phase noise. After working with Dieter DF9NP in investigating this problem and performing several tests, Dieter found that the problem was likely in the loop bandwidth of the 27MHz PLL. The loop filter bandwidth is 50kHz. He proposed the following component modifications to change the bandwidth to 300Hz. Update 2018-10-21: Dieter tells me that this problem has been solved in the new units he is selling, so the performance of the new units should be good. After I performed the modifications, I was quite surprised and happy with the results. As always, I’ve used the beacon of BADR-5 at 11966.2MHz to test the phase noise performance. Linrad’s AFC is in use. The result is below. As you can see, it is as good as the best references that I had tested before. For comparison, this was the performance before the modification. The difference is huge. Many thanks to Dieter for his effort and to Luis EA5DOM, who also participated in the discussion and gave some good advice. This is a follow up to a previous post where I investigated the phase noise of 27MHz references to be used for a 10GHz receiver. Dieter DF9NP has being kind enough to send me a 10MHz 0.25ppm TCXO to do some more tests. I’ve connected the 10MHz TCXO to the DF9NP 27MHz PLL and used it to receive the beacon of BADR-5, as I did in the previous post. The phase noise of the 10MHz TCXO + 27MHz PLL can be seen in the following figure. 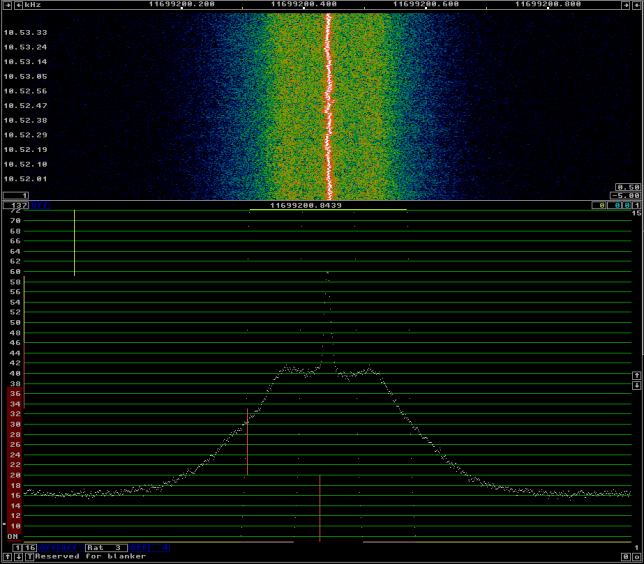 For comparison, see below the phase noise with the DF9NP 10MHz GPSDO and 27MHz PLL. There is not much difference between both. This seems to indicate that the culprit of the phase noise is the 27MHz PLL, as the 10MHz TCXO should be quite clean. Several of the Baofeng chinese handheld radios generate a weak 10GHz signal while in receive mode. Thus, they are a popular cheap and quick 10GHz signal source for tests. To generate a 10GHz signal, you have to tune the Baofeng to the 70cm band (for instance, 432MHz). The radio will generate a weak 24th harmonic while in receive mode. If you want a steady carrier, you have to set the squelch to zero. Otherwise you will just get beeps as the radio wakes up periodically to check for a signal. Lately, I’ve being investigating phase noise and reciprocal mixing of 10GHz receiver systems. A natural question is how good is the phase noise of a Baofeng used as a 10GHz signal source and whether it can be used to check if the phase noise performance of a receiver is acceptable. It turns out that it is not so noisy as one may first think. In my previous post, I mentioned the possibility of receiving 10GHz beacons reflecting off ships in the Mediterranean sea through the Paella Team WebSDR, in Alicante. Luis EA5DOM tells me that these reflections happen often. However, I didn’t get any in the time I was doing the recordings for the previous post. After making much longer recordings, I have seen a couple of reflections. I would say that a dozen or so happen every day. However, they last for quite long. Here you can see a reflection lasting for almost 20 minutes. The Doppler shift ranges between -300Hz and -200Hz. At its strongest moment, the reflection is only 10dB weaker than the beacon. I have being receiving several 10GHz on different WebSDRs with linrad to get a rough idea of the performance of the beacons and receivers, both in terms of frequency stability and phase noise. Here are the results. OCXO/Si5351A kit. This kit includes a 27MHz OCXO and a Si5351A frequency synthesizer. The Si5351A can act as a buffer and output the OCXO signal directly or generate a 27MHz clock. A DF9NP 27MHz PLL and a DF9NP GPSDO. 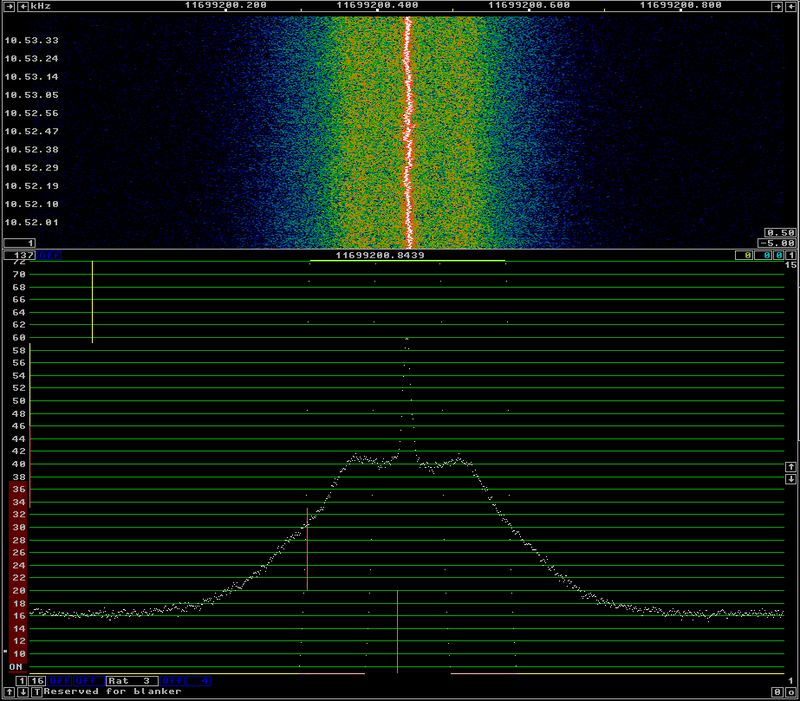 The GPSDO generates a 10MHz signal which is locked to GPS. 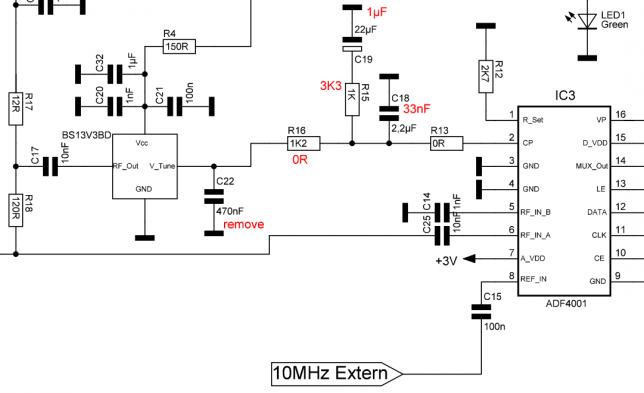 The PLL generates a 27MHz from the 10MHz signal. I’ve used linrad to receive the beacon of BADR-5 at 11966.2MHz using different references for the 27MHz signal. The AFC in linrad tries to compensate for any drift in the reference or the satellite beacon. By averaging, one can get good plots of the sideband noise of the beacon. This is far from a proper lab test, but it gives a good idea of the performance of the references. Yesterday, there was a big hailstorm in my town. 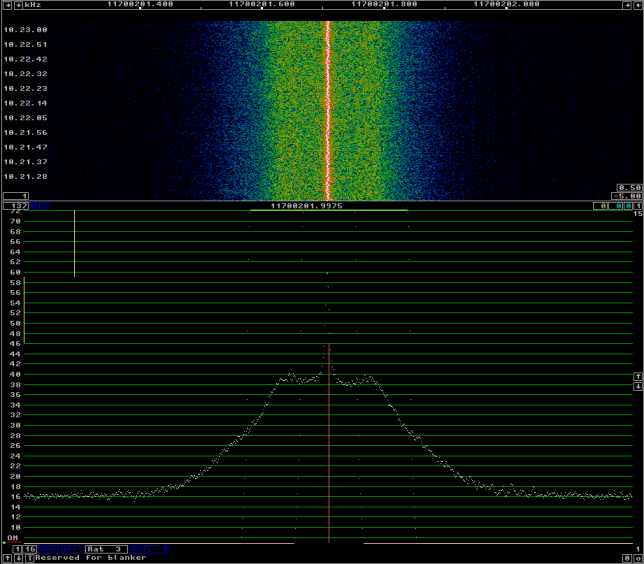 During the storm, I rushed to the radio shack to see if this produced any effects in my Ku-band satellite receiver. This is a 95cm dish pointing to the 26ºE geostationary orbital position, and it will be used to receive Es’hail-2 in the future. In the image below, you can see that the difference is huge. In the waterfall, you can see several beacons from broadcast satellites. It is clear that during the hailstorm the noise floor was much higher. In fact, 2.5dB higher. This is probably caused by scattering of DVB-S signals from satellites in other orbital positions, scattering of thermal ground noise, or a combination of both. Also, although it is not easy to see in the waterfall, the beacons of the satellites where weaker during the hailstorm. For instance, the beacon of BADR-5 was 0.9dB weaker, due to the increased attenuation caused by hail. These differences may not seem large, but in fact they are. I have a cheap DVB-S2 decoder connected to the system. It usually receives fine several channels from the BADR satellites (on some other channels, the signal is not good enough, apparently). However, during the hailstorm, this receiver couldn’t even get a lock on the DVB signal.